Scarce early edition of Eldridge's chart of Buzzard Bay. Eldridge's Chart No. 10. Buzzard Bay, from the United States Coast and George Eldridge's Surveys. 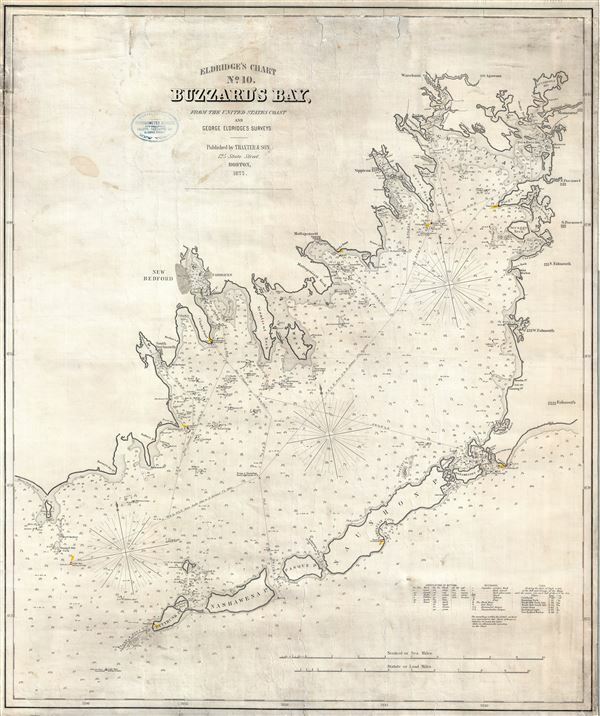 A scarce separately published 1877 nautical chart or maritime map of Buzzard Bay by George Eldridge. This elegantly produced chart on thick stock covers from the west coast of Cape Cod and includes New Bedford, Falmouth, Sippican, Wareham, Woods Hole, and Mattapoisett, among other towns. Eldridge provides excellent maritime detail throughout with numerous soundings (in feet) and notations for undersea ledges, shoals, and other dangers. Cartographically this chart is based on the work of the U.S. Coast Survey (U.S.C.S.) as well as Eldridge's own private surveys. A stamp on the front of the chart identifies the original seller, Michael Rupp and Company. Rupp was a New York City based manufacturer of chronometers (nautical clocks) and chartseller. His offices were at 39 South Street in what is today the South Street Seaport historic district. The verso bears two stamps, one identifying the chart and a second offering a catalog of Eldridge charts numbering 1 through 13, this being no 10. Eldridge originally published this chart in 1874 and it remained popular and went through numerous editions until about 1895. The present example, 1877, is therefore an unusually early edition. George Eldridge (November, 1821 - August, 1900) and his son George Washington Eldridge (1845 - 1912) were American makers of Nautical Charts and Pilot Books active in the late 19th century. George Eldridge was Cape Cod fisherman known locally as an excellent ship's pilot. While recuperating from an injury in 1851, Eldridge drew his first nautical chart. The chart proved popular and its success led Eldridge to pursue a career in hydrography - the science of mapping the sea with a special focus on navigation. Eldridge produced numerous subsequent maps and is credited with issuing some of the earliest accurate nautical charts of the American Atlantic coast. In time George Eldridge passed his thriving business on to his son, George Washington Eldridge, who continued to produce beautiful, practical, maritime charts well into the early 19th century. Though most of Eldridge's charts were loosely based on U.S. Coast Survey work, they proved popular with navigators a talent, shared by both father and son, for distilling the often convoluted Coast Survey maps into practical nautical chart charts for the working mariner. From 1875, in addition to large format independently issued nautical charts, Eldridge also issued annual editions of Eldridge's Tide and Pilot Book and The Book of Harbor Charts. The Eldridge offices were located at 103 State St. Boston, Massachusetts. Samuel Thaxter and Son (fl. 1722 - 1916). Samuel Thaxter (1769 - 1842) is the founder of a Boston dynasty of manufactures of mathematical instruments and nautical charts. He founded the firm in 1792 and is first referenced in the 1796 Boston Directory. Around 1822 he incorporated his son, Joseph H. Thaxter (1801 - 1835), into the business renaming it 'Samuel Thaxter and Son'. The firm would retain this name for the remainder of its existence. This successful business was subsequently passed to Joseph H. Thaxter's son, Samuel Thaxter Cushing (1821 - 1882), in 1843. It was Thaxter Cushing who developed the firm's publishing arm, partnering with the Boston nautical chart maker George Eldridge. They are best known for 13 large format blueback charts focusing on the east cost of the United States published in the second half of the 19th century. They also published numerous smaller maps and pilot books. After Thaxter Cushing died the firm was taken over by his widow, Abby C. Cushing, who managed it until 1905. It was subsequently managed by Herbert Risteen Starratt and continued to be registered in the Boston Directory until about 1916. Very good condition. Professionally flattened and backed with fresh linen. Upper boarder repaired. Minor soiling. Boston Public Library, Leventhal Collection, G3762.B8P5 1876. OCLC: 57014527.